Fun Science Fact-Are you a square? Are a square? In other words, is your arm span the same length as your height ? You can find out if you are a square by measuring your arm span and height,and then compare the measurements. Measure your wingspan by measuring from fingertip to fingertip. 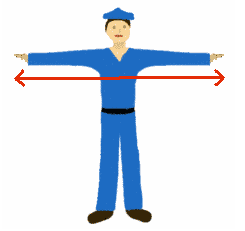 Almost all adults have an arm span slightly longer than their height. Some children have equal lengths because they are still growing. An abnormally long arm span may be an advantage in some sports, but could also be an indication of a medical condition called Marfan's syndrome.